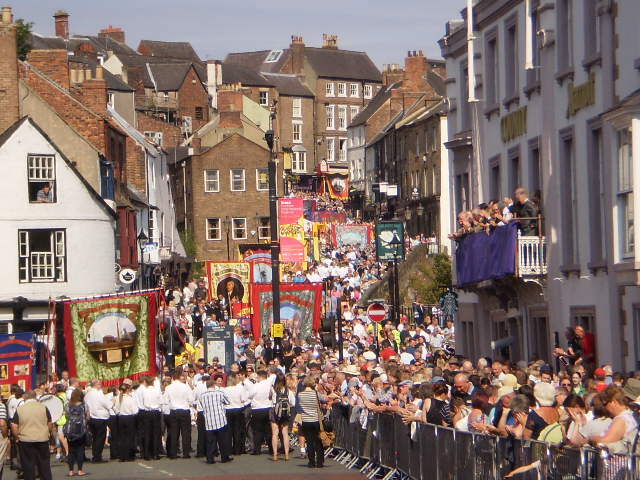 The 130th Durham Miners Gala was held on Saturday 12th July 2014. It was one of the largest ever gatherings and took place in glorious sunshine. Known as the Big Meeting, it was a spectacular and colourful success. It celebrates the history, the heritage and the human struggle of the mining communities of the North East of England. General Secretary of the Durham Miners Association, Dave Hopper who presided, extended a warm welcome to the massive attendance at the Racecourse, on the banks of the River Wear. Earlier he had reviewed the massive parade from the balcony of the County Hotel at the Old Elvet for over 5 hours. Thoughts of the 30th Anniversary of the British Miners Strike were never far from proceedings, especially since the release of Thatcher Government’s Cabinet papers which exposed both the true extent of the planned pit closures and how far Mrs Thatcher was prepared to go to break the National Union of Mineworkers. 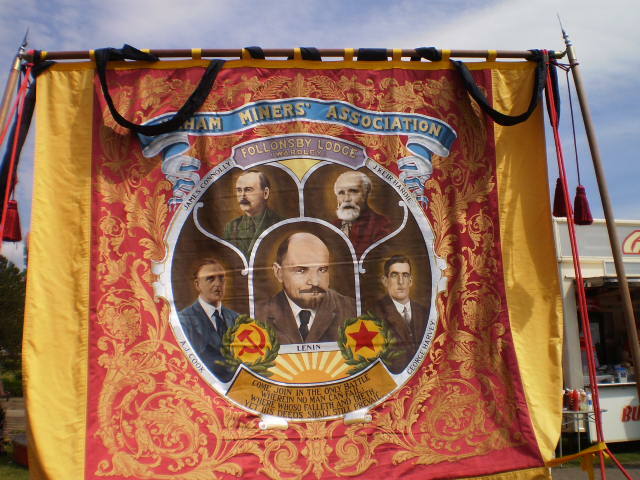 The Durham Miners Gala is an extraordinary manifestation of union, worker, community solidarity, something which Mother Jones advocated. The Gala’s historical legacy goes back to 1871, over 140 years yet it does not forget its history of struggle or its heroes such as Tony Benn, Bob Crow and Stan Pearce all of whom passed away in the last few months. A key speaker, Denis Skinner MP advocated a “new Durham Manifesto” to safeguard decent working conditions, decent pay and fair play. Yet as one listens to the Bishop of Jarrow, the Right Reverend Mark Bryant at the wondrous Durham Cathedral, during the blessing of new miners banner produce a moving sermon based on “people being at their best when pulling together” and one witnesses the pride of a packed Cathedral as five Miners Brass Bands parade up the central aisle with their new banners, the centrality of miners suffering and experience and their bonds of solidarity to the wider community and society is never in doubt. 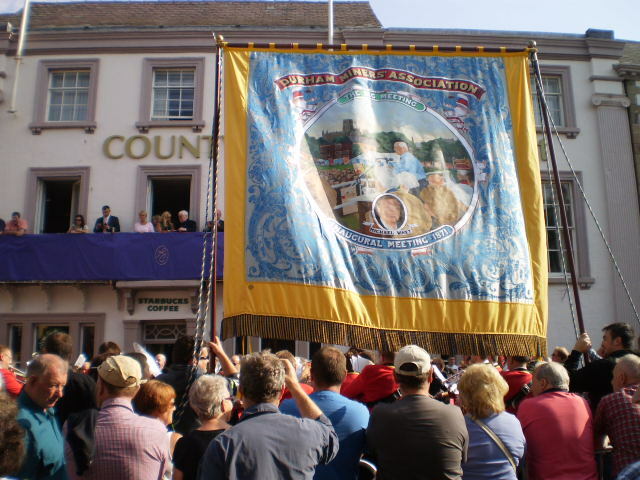 The challenge will be to ensure the Gala’s future, however it was very evident from the number of school and community banners appearing behind the main lodge banners on the Parade and the huge numbers of young people attending that that process is well under way. Dave Hopper will speak at the Spirit of Mother Jones Festival on Thursday afternoon at 3.15 at the Firkin Crane as part of the Festival’s “Miners day”. 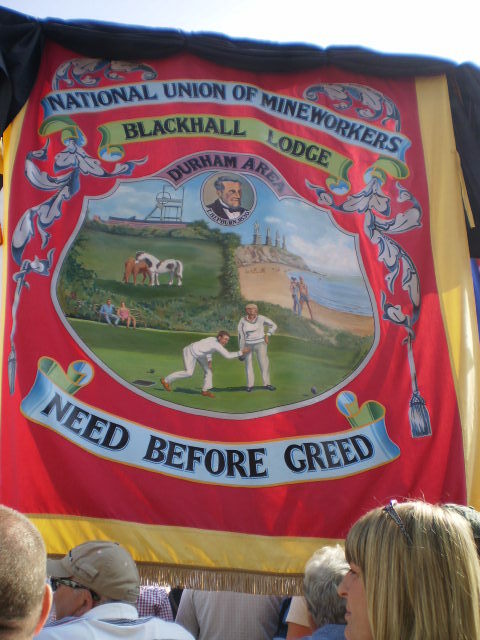 Betty Cook and Anne Scargill of Woman Against Pit Closures (WAPC) along with Paul Winter of the Orgreave Truth and Justice Campaign are also speakers in a series of presentations which begin at 11am and continue throughout the day and evening.